April Fools? Nah, April FEELS! Get your feels ready, because #romanceclass is preparing to serve up loads this coming April! The very first #AprilFeelsDay is happening on April 17, 2016 (that’s a Sunday) at Pegi Waffles, San Juan, Metro Manila–and YOU are cordially invited! Yes, whether you’re an author, a reader, an artist, or simply someone who has feelings, you are very welcome to join us. A number of activities are in store for you, including #romanceclass live reading, spoken word poetry, romance writing and publishing Q&A, book launches, selling and signing, and even tarot card reading! Entrance fee is P200, inclusive of free snacks and a book (available until supplies last). Now, if that doesn’t excite you, I don’t know what will. Questions? Here’s an FAQs page for your reference. 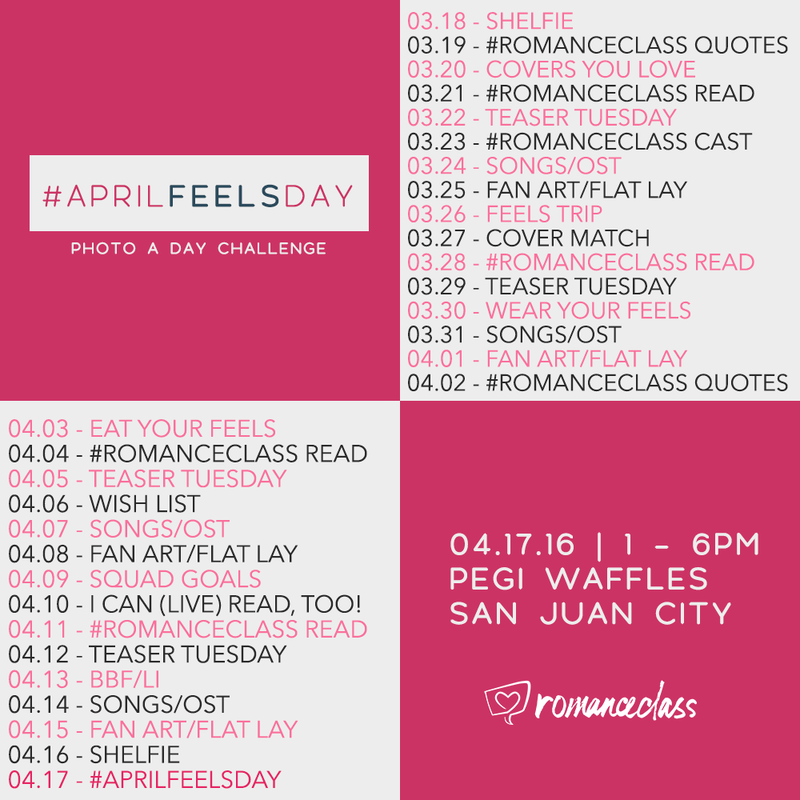 Follow Romance Class Books on Instagram for more details on the daily challenge, and don’t forget to use the hashtags #romanceclass and #AprilFeelsDay each time you’re posting your challenge. I’m excited to see everyone’s posts . . . and of course, more excited to see you on April 17! Coming to #AprilFeelsDay? PRE-REGISTER HERE!